Leading lawmakers identified Belgium as a hotspot for terrorism months ago and are warning that many of the radicalized individuals living there are still able to travel to the United States without first obtaining a visa and undergoing thorough security checks. Rep. Ron DeSantis (R., Fla.), a member of the House Foreign Affairs Committee, told the Washington Free Beacon Tuesday afternoon that current flaws in the U.S. visa waiver program—which facilities travel to the United States from partner nations including Belgium—have created a loophole that could permit radicalized individuals to legally enter the United States with minimal background checks. DeSantis is warning of these flaws on the heels of deadly mass terrorist attack in Brussels on Tuesday that has killed at least 30 and wounded hundreds more. "The visa waiver reform, this is something we have been perusing and the [Obama] administration has brushed us off at every turn," DeSantis said, explaining that current policy does not mandate more strenuous checks on individuals identified as coming from terrorist hotspots, such as the small Belgian town of Molenbeek, which has emerged as a principal training site for jihadists. "It’s the case that if those folks are citizens of Belgium they qualify for the visa waiver program and can hop on a plane and get here," he added. "Clearly, that is not adequate given what happened." The Obama administration "even takes the position it's safer to allow someone to come in on a visa waiver than make them get one, it’s kind of crazy," DeSantis said. You’re not going to be able to have intelligence on everyone there because there are so many potential recruits. It’s a clear vulnerability." What is worse, DeSantis said, is that the Obama administration has been lax about deporting individuals who overstay their visas, meaning that a radicalized person could disappear in America as they plan a potential attack. "There’s no enforcement once they get here," DeSantis said. "Hundreds of thousands of people come over and then overstay" their visas. "You are not going to be removed under current policy under this administration." DeSantis and other lawmakers first labeled Belgium as a hotspot for ISIS terrorists in the aftermath of the 2015 attacks in Paris. At least five of the Paris attackers were French nationals, two of whom had been living in Belgium. Another one of the terrorists was a Belgian national. Citizens from both countries are still able to freely travel to the United States under the visa waiver program, which facilitates travel between the American and a host of foreign countries. "At least six of the Paris attackers could have attempted to enter the country under this program," DeSantis said in December, during a congressional hearing on the visa waiver program’s flaws. Molenbeek in particular "is a hellhole that is filled with Belgian national Islamic radicals who qualify to travel to the U.S. without a visa under the visa waiver program," DeSantis warned during the hearing. DeSantis said on Tuesday that following the attack in Paris, he realized that the United States is vulnerable from threats in Europe, in addition to those from Syria and other terror strongholds. "The problem was not just people coming from Syria," he explained. "There was a major vulnerability from places in Europe and this Molenbeeck neighborhood was one of the most egregious that I had seen." 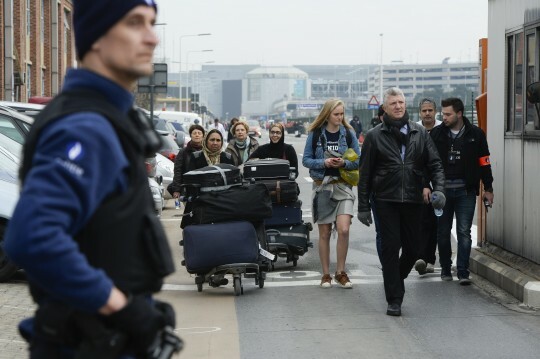 The Department of Homeland Security acknowledged on Tuesday that Belgium is still a part of the visa waiver program, and that policy has not shifted in the wake of the attack. "Though we do not require Belgian citizens to have a visa to travel here for business or tourism purposes, both the Transportation Security Administration and U.S. Customs and Border Protection have procedures in place to identify and prevent travel here from Belgium by individuals of suspicion," Jeh Johnson, DHS secretary, said in in a statement on Tuesday. "All travelers arriving in the United States are vetted against the U.S. Terrorist Screening Database, regardless of whether they arrive with a visa or an Electronic System for Travel Authorization," Johnson said. "We continually evaluate whether more screening is necessary, particularly in light of today’s attacks." Asked about these screening methods, DeSantis cast doubt on the United States’ ability to thoroughly vet these individuals, explaining that gaps in U.S. intelligence cannot account for the large number of radicalized Europeans. This entry was posted in National Security and tagged Ron DeSantis, Terrorism. Bookmark the permalink.